The main farm location - 507 Hwy 376, Central West River. Take Exit 19 or 20 off TCH 104 to Route 4, follow the signs to Hwy 376, go 2 km north on 376. New Glasgow location - 575 Stellarton Rd. New Glasgow. Take Exit 24, keep to right, first street off roundabout, under the highway, keep going north on Stellarton Road, 1 km. 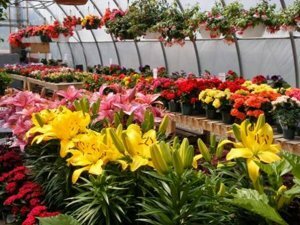 One of the largest varieties of annual and perennial plants in Nova Scotia. Hard to find vegetable plants and flowering plants, always healthy, potted or packs. Extra large baskets, and patio planters custom planted or ready to go. Also roses, trees, shrubs, soils, accessories adn more. Locally Grown, Naturally Trusted. Relaxed atmosphere, friendly staff, lots of free advice. Farmer Bob & the Missus would love to have you drop in, for a wee visit, and see what we have to offer for all your gardening needs.